We all love our first home but eventually there comes a point when it’s time to move on. Life changes and so do our needs and wants in a home. When you are ready for a new home but also have one to sell or rent-out, the stakes are much higher. This time around, you’ve got more to think about, plan, and “get right” then when you bought your first home. Our 5-part weekly series is a “how-to” guide for moving up to your next home with as little stress as possible. Whether it’s your first time moving up or you’ve done it before, this series is a great resource. First up, how do you decide if you should move or stay in your current home. 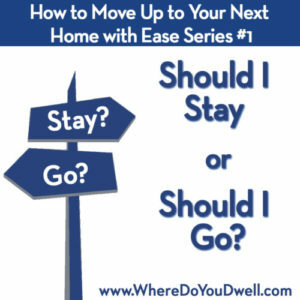 The Clash said it best in their hit song, ‘Should I Stay Or Should I Go’ and that might be what you are feeling now that you’ve been in your home for a while, but how to know what the best decision is—should you stay or should you go? Financial Outlook. Your employment is steady, your income is improving, and your entire financial situation looks good now and down the road. This means three things: 1) You will get approved for a mortgage; 2) you can afford higher mortgage payments; and 3) you can own a more expensive, larger home. Healthy Housing Market. If the market is stable or flourishing, than it’s a good time to sell your current home and buy a new one. Homes priced right will move and that’s good if you’re a seller. It’s better to avoid a sluggish time in the market. Your home could take a while to sell and who wants to drag it out and not get the price you were hoping for. Location, Location, Location. When you bought your current home, it probably felt like the perfect location for you, but maybe not now. So many variables go into what makes a good neighborhood for you and your family at this specific time. It might not be a kid-friendly neighborhood and you want a better school district, or you changed jobs and now spend more time in the car, or maybe the neighborhood itself has changed. Maybe your quiet street is now too busy. Perhaps you want a stronger community feel or a more walkable neighborhood. Or you want a larger yard and more space between neighbors. It all comes down to what you want now and where you picture yourself living. Plan to stay at your next home at least five years, and what your life is going to be like then. Can’t or Won’t Remodel. You love HGTV and can just imagine your home remodeled and updated with larger rooms, gleaming kitchen. But you realize it’s only a fixer upper dream. Your yard is too small for an addition, you’re not zoned for it, or you just can’t live through the mess or cost. Plus, you never want to be the nicest house on the block. Moving can provide you with more sanity, more room, and you can ditch the rejiggering of the floor plan. Space Invaders. You want to increase your home’s size since your family is growing OR you want to downsize since your kids are gone. Whatever the direction, you’ve realized the size and space of your home doesn’t work for you and your family anymore. You want space for toys (yours and theirs!) and to say good-bye to cluttered, cramped rooms. Or, you don’t need 4 bedrooms anymore and want a more manageable home and yard. Space needs can change dramatically in a short period of time so plan accordingly for down the road. Green Acres. Homeowners either love big yards or hate them. Have you figured out what you like? Yard space can be a wonderful addition to your home — for entertaining friends, for kids, for dogs, for gardening, for just getting some fresh air. Even a small patio or deck or even a nearby park may be what you are looking for next. If you don’t want to mow every Saturday or don’t have enough privacy between you and your neighbor’s yard, and it’s nagging you. Every. Single. Day … then it’s time to move. Next up in our series for week two is a must-read, or should we say a must-answer! What Move-Up Buyers Need to First Ask Themselves provides the questions that can lead you to your next home purchase.